How long does an engine family need to survive in front-line use to become a legend? 42 years, like the Toyota R? 47, as with the small-block Chevy? Today's engine may have them both beat! 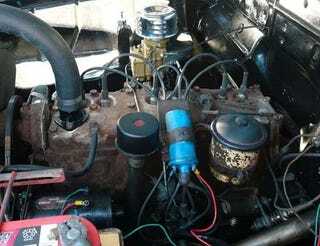 The first Chrysler Flathead Six, a 68-horsepower engine displacing 201 cubic inches, appeared in 1924, and it was still being installed in Dodge Power Wagons and military M37 trucks as late as 1968 (the last of the Flathead Six-powered Chrysler cars rolled off the assembly line in 1959). After that, Chrysler kept making the engine for industrial and farm use well into the 1970s. 50 years, or just close to it? We'll need input from you serious vintage Mopar experts to know for sure!